Italy is in mourning for one of its favourite and daredevil sons, Marco Simoncelli who died on Sunday during a GP Motocross race in Sepang, Malaysia. 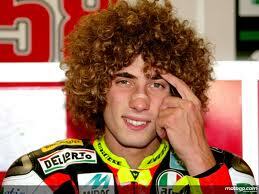 Marco was only 24 and already a world champion. He had been racing and winning tournaments since he was nine years old. A flamboyant, exurberant, yet gentle charactor he was well liked and appreciated in the racing scene and out of it. A close friend, and of similar elk, to Valentino Rossi, the first place Italian motocross racing champion. It was with a shocked silence and holding our breath on Sunday night that my husband and I waited to hear of how Marco was after seeing the horrific accident that took him off the field just two laps into the race. His inert body left on the track immediately after the three bikes collided, and helmet that had bounced off were hard to take in. Shortly after he had been taken off the field the red flags were waved and the race was cancelled. Commentators were at a loss for words during the seemingly endless amount of time with no news and no racing going on while all of us were hoping against hope that there would be good news. That his injuries were substantial no one could doubt, but in spite of it being such a dangerous sport, no one is ever prepared for the worst. This entry was posted in italian culture and history, marco simoncelli, memoirs, travel and tagged GP Motocross, italian life, italy, marco simoncelli by brontejackson. Bookmark the permalink. What a great rider, and so young to die. He came second on the podium last week in Australia, and now gone. This is a real tragedy!!! !